It started a week ago on Monday; I discovered that our Toilet was leaking. I had a full week, and plans for Saturday, so I put down a bucket to catch the slow drip, and plan on fixing last Sunday. Well when I took it apart, the idiot who installed it used epoxy to glue down the front. This caused the front to crack, which is OK as it was cracked elsewhere. However, this was an expense I was not planning on. Well as we had guests this weekend, I had parked downtown, so when I need to go get a new toilet (no one was home at the time.) So I got the new toilet, and got home to install it, and I was working on the cat ran under my feet, and in trying not to step on it, I tripped, and fell. As there was a shattered toilet in the tub I did my best to avoid it, but this resulted in my landing on my ribs right on the edge of the tub. Lucky for me I did not break my ribs but they are bruised. This has been making any tangling difficult as it hurts to move my right arm. 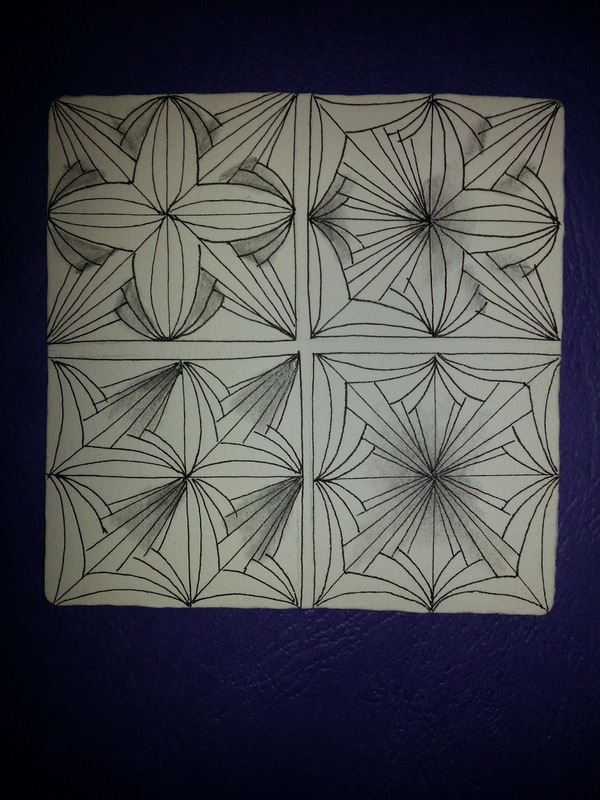 It is sad as I can use Zentangle® to help with pain, but when doing it causes pain it makes me sad. I was able to at least get this this week’s adventure done. I had lots of plans for week 10, but I am happy with what I done. The tangle I decided on is both straight, and curved. I did enjoy this Tangle, I hope you do also. Here is the link to the tangle on Tangle patterns. Sorry to hear about your ribs. I am suffering from bronchitis and have coughed so hard, I have bruised my ribs, so I can sympathize. Hope yours is better soon. Your tile is lovely, I love the options of shading you used. Thanks for your challenge's they give me a push to try something new. Enjoyed this weeks tangling adventure. Thank you for setting it even under duress. Was not satisfied with the first one so after a thinking on a couple of options decided to give it another go. Bad week for you, Roy. Sorry you hurt yourself. We have both a dog and a cat and they always seem to be underfoot! At first, I couldn't think of what to do with this monotangle. I did the first one "inside out", and decided to do a second. I love that this tangle pattern works that way. I don't know if I would have discovered that without your challenge. Thanks. Oh I love this pattern, I will surely use it again soon. I'll use this one again. Thanks for encouraging us to create out side our comfort zones. Hope you are feeling better and that all your plumbing problems resolve themselves soon. I love this new tangle. Can't wait to see what the next challenge will be. Yep I'm in again. Love to do this challenge.